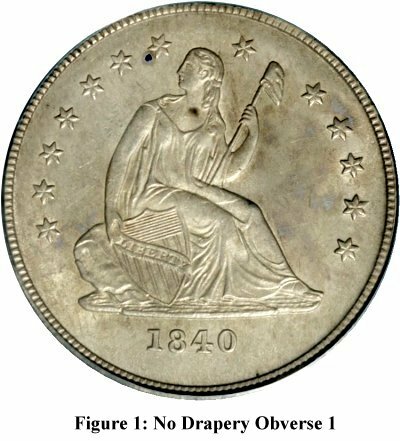 The 1840 With Drapery Large O quarter (which I will abbreviate as 1840 WDLgO) was called the “rarest collectible seated quarter” in The Comprehensive Encyclopedia of United States Liberty Seated Quarters. There were 16 confirmed examples at the time of the book’s publication in 1991. Since then a number of examples have surfaced with current estimates at about 40 pieces in all grades and conditions. 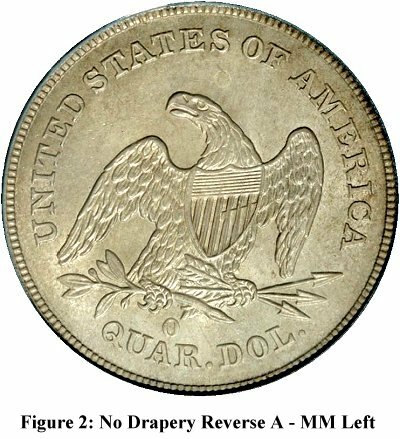 It is a well-known and highly regarded variety pairing the newly introduced with drapery obverse and a reworked reverse previously used to strike no drapery quarters at the New Orleans mint. It can accurately be referred to as an important transitional coin. 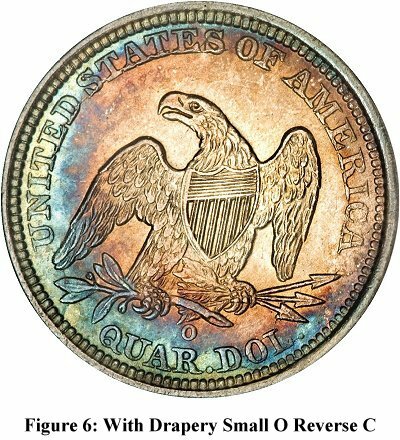 The 1840 WDLgO quarter was voted number 7 in the Liberty Seated Collectors Club survey of the 10 greatest New Orleans seated coins (Gobrecht Journal Issue 101), finishing as the third highest rated quarter in the group behind the 1849-O (#3) and the 1842-O Small Date (#6). It was included as coin #2 in the Top 25 Seated Quarter Varieties described in Gobrecht Journal #111. This month’s column will provide some additional photographs of the variety, a photographic summary of the other 1840-O seated quarter die pairings, and some speculation regarding the minting of these coins. There are five known die pairs for the 1840-O quarter. The two no drapery obverses and two no drapery reverses continued the die style used in Philadelphia during 1838 and 1839 and were presumably used early during 1840. Figure 1 shows no drapery obverse 1 as paired with no drapery reverse A, illustrated in Figure 2. Coins from this die pair are known as the “mintmark left” variety. 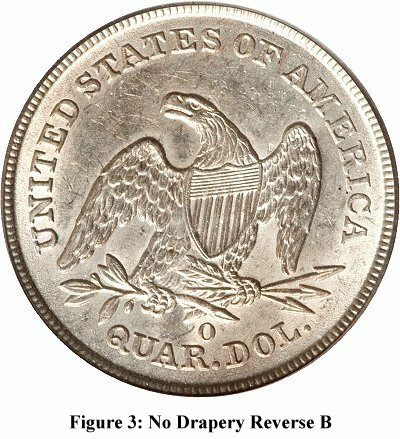 No drapery reverse B, shown in Figure 3, features a dramatically different mintmark position from reverse A. The two no drapery varieties are thus quite easy to distinguish. The only known no drapery die pairs are 1-A and 2-B; neither obverse die appears to have been paired with more than one reverse. A new with drapery obverse die apparently arrived part way through the year (most likely in June). The no drapery reverse B was reworked and paired with the new with drapery obverse. The reason for this is not obvious since according to mint records a new reverse die was shipped with the new obverse. 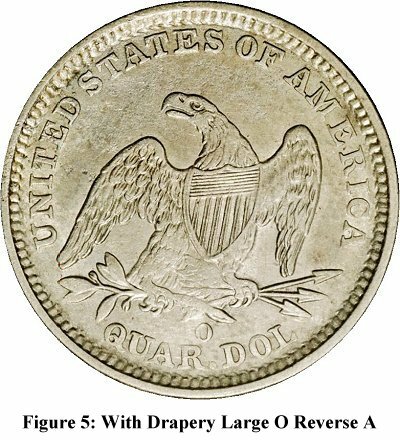 Figure 4 shows a with drapery obverse and Figure 5 the reworked no drapery “large O” reverse that was paired with the with drapery obverse. Note the second set of hand cut denticles and the pronounced weakness on the right feather and left leg of the eagle. All known examples of the 1840 WDLgO have this weakness on the reverse and when certified are frequently undergraded because of it. The first with drapery obverse that was paired with the large O reverse was also paired with a small O reverse (that die – Briggs reverse B - is not illustrated here). The final New Orleans mint die pair of 1840 is Briggs 2-C illustrated in Figures 4 and 6. Interestingly, reverse C was re-used in 1841 (or more likely in December 1840) to strike the first 1841-O quarters and is dubbed reverse A for 1841. Note that the emission sequence proposed here is speculation based on research and insights published by Randy Wiley in issue #99 of the Gobrecht Journal. There is not hard evidence to prove that the coins were, in fact, produced in such a sequence, but the sequence is both plausible and consistent with what is known. That sequence is : 1) No Drapery Mintmark Left (Briggs 1-A); 2) No Drapery Mintmark Centered (Briggs 2-B); 3) With Drapery Large O (Briggs 1-A) – reverse die reworked No Drapery reverse B; 4) With Drapery Small O (Briggs 1-B) – same obverse die as the 1840 WDLgO; and 5) With Drapery Small O (Briggs 2-C). 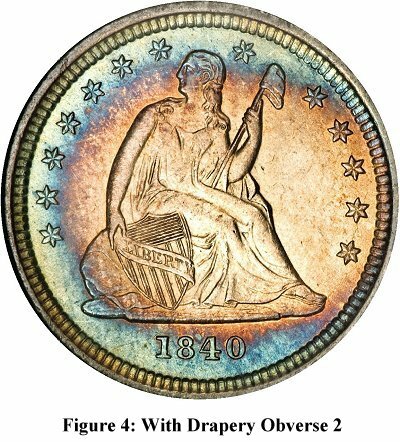 The year 1840 is a most interesting one for collectors of seated coinage, with many transitional coins, mules, experiments, mistakes and other varieties to study. Anyone with a particular interest in this year is strongly encouraged to read “The New Orleans Branch Mint in 1840” by Randall Wiley in Issue #99 of the Gobrecht Journal. The Comprehensive Encyclopedia of United States Liberty Seated Quarters, Larry Briggs, Lima OH 1991. The New Orleans Branch Mint in 1840, Randall Wiley, Gobrecht Journal Issue #99, pages 3-14. The Ten Greatest New Orleans Seated Coins, Gobrecht Journal Issue #101, 53-57. The Liberty Seated Quarter Top 25 Variety Set, Greg Johnson and Len Augsburger, Gobrecht Journal Issue #111, pages 3-27. Photos courtesy of Heritage Archives.